As word spreads about our plan to make whiskey from heirloom corn varieties that we grow ourselves, the project is beginning to take on the feeling of a crusade. There are as many people interested in the corn growing as the whiskey making. Here is what we have accomplished so far. 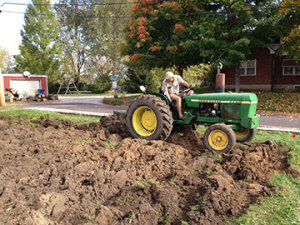 Greg Newell, a New Haven area resident and Master Gardner, has volunteered to lead the farming part of this project. He has been involved with demonstration gardening with the Missouri Botanical Garden and Schlafly Bottleworks in St. Louis. His passion for agricultural sustainability and biodynamics are a perfect fit. Ground was broken last month at the propagation plot across the street from the distillery. Some large foundation stones were uncovered, along with a quantity of brick from demolished structures. A group of high school students who are Future Farmers of America members (FFA) will remove the debris and help prepare for planting. Soil tests indicate the ground is of good fertility for growing corn. Greg has secured seed for all three heirloom corn varieties that we will be focusing on this year. These are Tennessee Red Cob, Pencil Cob and Hickory Cane. Tennessee Red Cob and Hickory Cane will be planted in the propagation plots to grow seed corn for next year’s production. Greg was able locate enough Pencil Cob to plant a full acre, about 20 pounds of seed. A 325-gallon pot still with a Scotch style head has been ordered for March delivery. It’s identical in appearance to the 60 gallon still we are currently using, but without the fractioning column. This unit will be used for ‘stripping’, which is the first step in extracting alcohol from a fermented mash of grain and water.